Cheap Cupcake Eraser/Sharpeners - 6 Ct. Though they look good enough to eat, these candy-scented cupcake erasers have a dual functionality: the tops pull off for easy erasing, revealing a pencil sharpener inside. 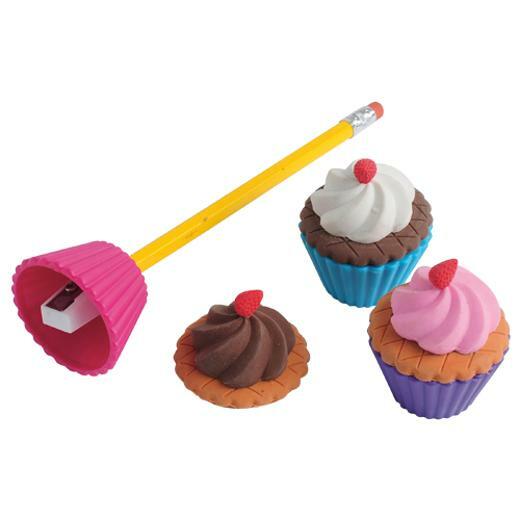 Accessible from the bottom of the cupcake, easily sharpen your pencil and then erase your mistakes. Pull cupcake apart to dispose of pencil shavings. A great stationary product for school supply lists or pass them out as party favors at your next candy buffet party. L: 1.75 in. W: 7.0 in. H: 6.5 in.